(CNN) -- Walk past the southern face of the Musée du Quai Branly, Paris, and you will be greeted by a massive wall of brilliant green foliage -- an 8,600 square feet plant installation by the designer Patrick Blanc, featuring more than 170 different species. 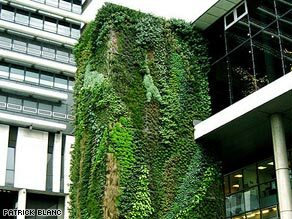 One of Patrick Blanc's green walls on the Hotel du Department in Hauts-de-Seine, France. The mass of leaves and flowers seems to be swallowing the building -- and provides a proud symbol of resurgent nature in this busy, downtown district. The amazing spectacle is one of the largest in a growing number of "plant walls" or "vertical gardens" that are taking root across the world, as architects search for environmentally friendly ways to create beautiful buildings. Some visionaries even believe that soon we could be harvesting our food from the places where we live and work. Architect Ken Yeang is the world's leading green skyscraper architect and a passionate advocate of what is already being called "vegitecture". Yeang's designs use walls of plants, scallop-shaped sunshades, solar panels, advanced ventilation and the structure and of the building itself to collect water and catch cooling air currents. It enables the construction to function as a self-managing ecosystem with less need for external energy. Yeang has even talked in terms of future plans for "vertical farms" where residents could grow and harvest their food from the walls of their homes. But there are even grander plans in the pipeline. President Sarkozy of France recently asked ten teams of leading architects to re-imagine Paris as a city fully integrated with the natural environment. Among the results, Roland Castro's team suggested a huge 250-acre park circled by skyscrapers, while Richard Rogers submitted designs for rooftop gardens and parks that will hang above the city's railways. Other plans include urban forests and a network of vegetable patches. Designers claim that plants not only provide a beautiful alternative to other materials used in construction, they also offer additional benefits, including noise reduction, natural cooling, air conditioning and a psychological boost to those who use the buildings. "They're living walls, and they come in all sorts of colors, not just green," Richard Sabin of BioTecture told CNN, and whose walls have been incorporated in Gold and Silver Gilt medal-winning gardens at the Royal Horticultural Society's Chelsea Flower Show, London. "They can be flowering, edible -- we have just completed a wall that incorporates all kinds of salads leaves, such as pak choi and lettuce," said Sabin. "The future applications are endless; we're looking at the possibility of harvesting biofuel crops and even using plants for grey water filtration." Bringing nature indoors may also have health benefits. "The plants absorb toxins and have a really positive impact on air pollution," said Sabin. "NASA takes plants into space to help clean the air -- it's cheaper and more sensible than air conditioning. The same principle applies here." Sabin believes that traditional building materials can make the environment worse for people. "With concrete walls, noise and heat just bounce off, and so people just shut their windows and turn up the air conditioning. But living walls actually soak up noise and heat, and so suddenly people are opening their windows and you get natural ventilation again, and fresh air, which is much better," he said. "We can even do special air purification walls for inside buildings. They can actually drop the temperature by degrees, so you don't need air conditioning." According to Sabin, one other advantage is that living walls can offer developers a significant carrot with which to woo development control authorities when trying to get approval for new constructions. "There are massive plusses with planning," said Sabin. "The walls improve biodiversity. We can plant them with local species and even include solitary bee's homes in the design, which is something we really like to do -- and Government officers really like it." "Local authorities have to take climate change into account these days and buildings incorporating living walls create a refuge for species in urban environments and create more resilient habitats." The technology needed to sustain the plants is complex. Of course plants have made their homes on the walls of our buildings for as long as we've been building them. But these vast expanses of vegetation require more than just some wind-blown soil and a suitable crack in the masonry. The irrigation systems need to be able to keep the plants watered, while simultaneously protecting buildings from moisture; they must also be able to withstand root damage. Typically living walls are built using a sophisticated layering matrix of plastic and metal, all suitably arranged to maintain air circulation and temperature control. The plants themselves are housed in pockets of plastic and are fed and irrigated via a web of plastic pipes. All of this must be light enough to hang on the building. Critics argue that the thirsty nature of living walls detracts from their environmental credentials and they require more maintenance than conventional materials. But Sabin is adamant that this can be worked around with careful planning. "They can use a lot of water, but we've been working on systems that cut demand dramatically," he said. "A maintenance contract typically involves three visits a year. Two of these will be pretty cursory if we get the plant choice right, and only involve changing a few filters and the odd dead plant. Then once a year we will do a more thorough overhaul. "These aren't just the materials of the future; this is about now; about really bringing nature into our cities and true sustainability. I think that's inspiring."